I was fortunate enough to join a medical mission trip led by Global ENT Outreach to Phnom Penh, Cambodia from July 15 to July 20, 2012. This was the largest volunteer group to date for our host organization, led by founder Dr Richard Wagner, MD. On July 15th, we arrived in Phnom Penh, the capitol city of Cambodia after close to 20 hours travel. I joined 9 other volunteers, comprised of surgeons, nurses, medical students and nurse educators to provide otologic services in an area that nearly lost its cohort of physicians in an act of genocide 30 years prior. Today, a fractured health care system with poor infrastructure, limited resources, and inexperienced health professionals exists. 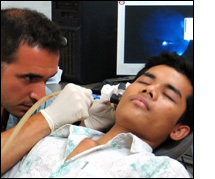 Rehabilitative efforts including a nascent Otolaryngology residency training program at the National Hospital Preah Ang Duong are underway, however otologic care in particular is poorly understood and underdelivered. I feel the experience was truly remarkable. Not only did I gain an appreciation for the difficulty of providing otologic care in a relatively impoverished area of the world, but my cultural awareness, competence, and sense of professionalism flourished throughout the course of the week. I would like to thank the Benjamin H. Josephson Fund for providing support for this wonderful experience and am confident that it has solidified my commitment for future mission endeavors.